Save an extra CDN$ 7.79 (36%). Buy the Kindle Edition instead. 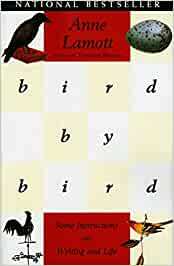 Start reading Bird by Bird: Some Instructions on Writing and Life on your Kindle in under a minute. I have read Anne's books for years but never thought to read her book on how to be a writer. That was a big mistake. As someone who loves to write myself I am once again humbled by the simplicity with with Anne makes things. If you have even a small desire to write, buy this book. Buy it now and then get started on writing your s***ty first draft. I absolutely love Anne Lamott. I love her wit, her humour, and her wonderfully real walk in faith. She is at once, irreverent and deeply, spiritually grounded. This is a very real telling of the writing process from her perspective. Even if you never plan on writing anything yourself, you will find some real gems to add to your own life philosophy. Lovely book, am now a big fan of her writing. Great instructions on writing and life. 5.0 out of 5 starsCouldn't put it down, so inspiring! This is a lighthearted and comical perspective on a variety of topics, all of which I found utterly inspiring and uplifting. It's a feel-good book, and it will leave you wanting to create something beautiful. At least that's what it did for me. Whether that's enough to get the ball rolling is up to you. 5.0 out of 5 starsI didn't know there was so much to take into consideration. Thanks for the instruction. I learned a lot! Very Entertaining too. LOL moments. Thin book, quick read but very informative. Lovely, laugh-out--loud funny, and a useful, inspirational 'handbook.' One could easily read and re-read several times over the curse of a lifetime. The best book on writing and life I've ever read! Get it, read it, and then read it again. Don't forget to pause to reflect and laugh.